In 2008 two brothers founded GetSmarter, a company offering online short courses in collaboration with world-leading universities. Ten years on, over 50,000 people have completed courses their courses. Just over a year ago, EdTech giant, 2U, Inc. acquired GetSmarter for an impressive R1.4bn. They recently held a function at their Cape Town offices to celebrate their broader integration with 2U, Inc. 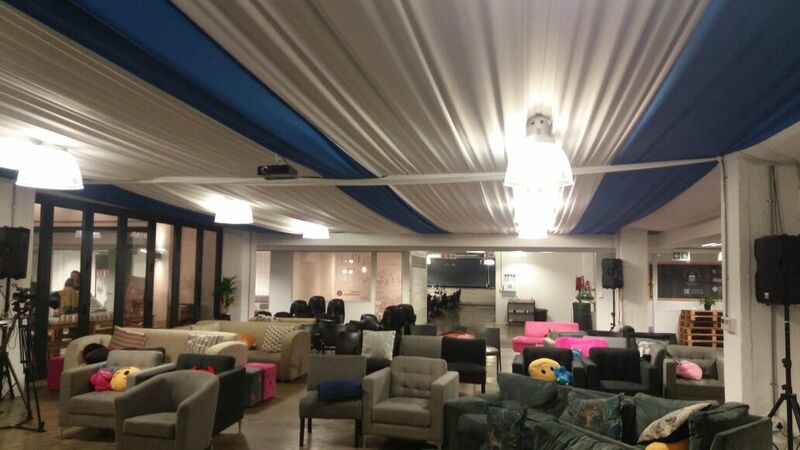 The Events Draping Co. team was tasked with draping the ceiling of their Huddle Space in white fabric with blue detail, reflecting the brand transition. In a rapidly changing world, they’re sure to continue delivering strong outcomes for working professionals.